NEW ANTIQUE BRONZE COLORED I YEAR ALCOHOLICS ANONYMOUS COIN. I WILL MAKE ANY PROBLEM RIGHT. NEW ANTIQUE BRONZE COLORED 28 YEAR ALCOHOLICS ANONYMOUS COIN. I WILL MAKE ANY PROBLEM RIGHT. 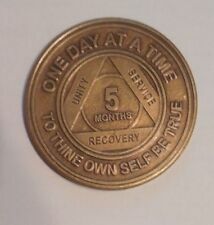 NEW BRONZE COLORED 5 MONTH ALCOHOLICS ANONYMOUS COIN. I WILL MAKE ANY PROBLEM RIGHT. I WILL MAKE ANY PROBLEM RIGHT. THE BACK READS GUARDIAN ANGEL AT MY SIDE TO LIGHT AND GUARD. I WILL MAKE ANY PROBLEM RIGHT. NEW ANTIQUE BRONZE COLORED 4 MONTH ALCOHOLICS ANONYMOUS COIN. I WILL MAKE ANY PROBLEM RIGHT. "Honoring the "Everlasting Spirit of Recovery". FOR RECOVERY ACCENTS, INC. In addition tothe three legacies triangle with "Unity Service Recovery". The reverse displays the AA Serenity Prayer: the refrain of AA's sobriety 12-step program. Which read These coins are made in the USA. Serenity Prayer on the back. AA Logo Circle with Triangle in the middle on the front. NEW ANTIQUE BRONZE COLORED 3 MONTH ALCOHOLICS ANONYMOUS COIN. I WILL MAKE ANY PROBLEM RIGHT. No Matter What Club Bronze Affirmation AA Tokens. This auction is for a set of 12 Aluminum Recovery Medallion Coins Commonly used in AA or NA or other Recovery programs like Alcoholics Anonymous or Narcotics Anonymous Each medallion is colored for that particular month. Classic Aluminum Medallions bring our high quality circle triangle tradition to the recovery community at an affordable price.With a rainbow of colors for each milestone our Aluminum Medallions are an attractive offering to commemorate your achievements. Medallions carry the Serenity Prayer on the reverse side of the coin. 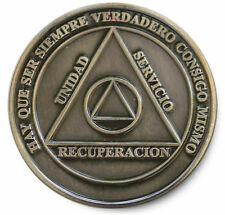 NEW BRONZE COLORED 15 YEAR ALCOHOLICS ANONYMOUS COIN. I WILL MAKE ANY PROBLEM RIGHT. On the back of coin Step B To Turn Your Will & Life. 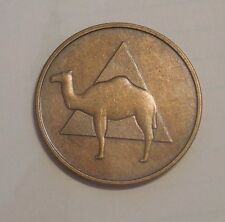 NEW BRONZE 2 MONTH ALCOHOLICS ANONYMOUS COIN. I WILL MAKE ANY PROBLEM RIGHT. Wendell's Dove bronze affirmation coin. On the back of coin is There will be earth upon which to stand. 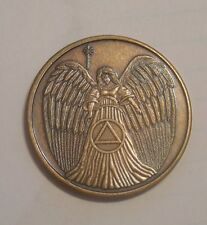 Angel Antique Bronze Affirmation Token. 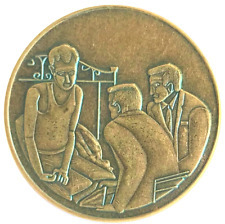 Man On Bed Antique Bronze Affirmation Token. 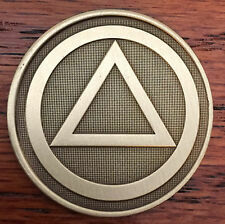 NEW BRONZE COLORED BLANK ALCOHOLICS ANONYMOUS COIN. I WILL MAKE ANY PROBLEM RIGHT. It has the serenity prayer on the reverse side. It has not been cleaned. See the actual photos below of what you will receive. 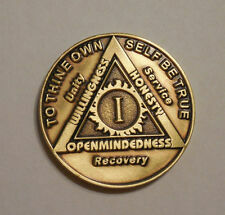 NEW ALUMINUM 1 MONTH ALCOHOLICS ANONYMOUS COIN. THE 1 MONTH COINS ARE ALSO AVAILABLE I IN BRONZE IN. I WILL MAKE ANY PROBLEM RIGHT. Front side shows: Acceptance, Faith, Surrender & Trust, Honesty, Courage & Willingness. On the back side: Humility, Forgiveness, Freedom, Perseverance, Patience, Charity Love. Often carried by those in recovery programs like AA NA Alcoholics Anonymous. Back of coin contains the Serenity Prayer. Front of the coin has a Serenity Lake Scene. Makes a great gift for our friends with 25 years or more in AA! 25 YEAR ALCOHOLICS ANONYMOUS COIN. NEW BRONZE COLORED. I WILL MAKE ANY PROBLEM RIGHT. Gold and Silver PlatedInfinity Year Sobriety Coin With Infinity symbol on the front. Elegant Black Color. Alcoholics Anonymous Chip. NEW ANTIQUE BRONZE COLORED 10 YEAR ALCOHOLICS ANONYMOUS COIN. I WILL MAKE ANY PROBLEM RIGHT. 5 YEAR ALCOHOLICS ANONYMOUS COIN. NEW BRONZE COLORED. I WILL MAKE ANY PROBLEM RIGHT. NEW ALUMINUM 4 MONTH ALCOHOLICS ANONYMOUS COIN. I WILL MAKE ANY PROBLEM RIGHT. NEW ALUMINUM 10 MONTH ALCOHOLICS ANONYMOUS COIN. I WILL MAKE ANY PROBLEM RIGHT. Use the Step cards and toolkit cards to work your way through but WATCH OUT.self-will or stinkin thinking could set you back. Play is easy. Draw one card and play one card. No discard in discard pile required. It has a deep glossy almost glass-like finish. This is a wonderful sponsor coin that states These coins are made in the USA. Finally, it is finished in a thick clear coat that protects and makes the coin visually stunning. 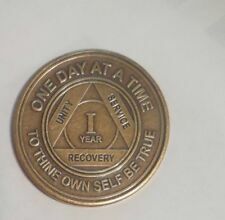 2 YEAR ALCOHOLICS ANONYMOUS COIN. NEW BRONZE COLORED. I WILL MAKE ANY PROBLEM RIGHT. NEW ANTIQUE BRONZE COLORED 11 MONTH ALCOHOLICS ANONYMOUS COIN. I WILL MAKE ANY PROBLEM RIGHT. 28 YEAR ALCOHOLICS ANONYMOUS COIN. I WILL MAKE ANY PROBLEM RIGHT. These are good looking sturdy silver color coin bezel with silver 24" chain with easy to install threaded bezel top - simply screw off top - put your coin in the bezel and screw the top back on. Silver Color Necklace/Pendant fits 34mm Traditional 1 3/8" Size AA/NA Coins Including Triplate Coins. Don't Take Yourself Too Damn Serious. Raised lettering and graphics. 1 5/16" or 33mm. Coin Finish:Brushed Antique Nickel. FOR RECOVERY ACCENTS, INC. The reverse side of the coin reads "Trust, Respect, Caring" with an iconic capital, a symbol relating to the ultimate foundation of support. Wendell's Serenity bronze affirmation coin with "Serenity isn't freedom from the storm It's the Peace within the storm" on the back. 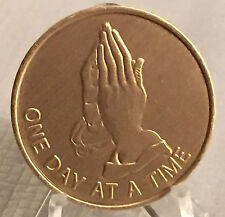 AntiquedBronze AA/NA/12 Step Recovery Program Coin /Token/Chip. FOR RECOVERY ACCENTS, INC. "NOTHING CHANGES IF NOTHING CHANGES". Newly designed, richly crafted coin.